Joysticks: Use the two 4-way joysticks to control your tank. 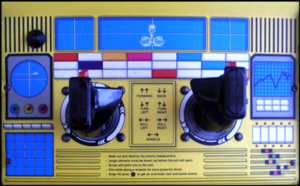 Push both joysticks up to make it go forward, down to make it go backward, the left one down and the right one up to make it turn left and vice versa to make it turn right, and both of them left or right to make it roll over. Firing Button: Use this button to make your tank fire at the enemies. Start Button: Push this button to start the game. The protagonist of the game. These can give you an advantage over the enemies and a spectacular view of the playfield. When your tank drives on to one, it will fly straight up to get a bird’s eye view of the surrounding terrain. From this overhead position, your tank can fire lethal nuclear missiles at the enemies.